Itou Asuka appeared in a play called "Ore no Kodomo janai" from February 5 to February 7, 2010. This play was written by seiyuu Shibata Hidekatsu, and featured many of the young seiyuu from the seiyuu production RME. 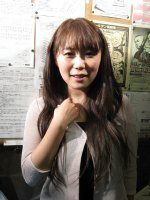 Sekine Akiko also appeared as a guest. The play itself was a little over one hour, and this was just the first part of the event. The second part of the event was a sit down talk show by Shibata Hidekatsu. All of the other seiyuu also sat down and participated in the talk. Shinjuku Golden Street Gekijou was a very small play theater (seats less than 50). I went to the first showing on Friday Febraury 5, and it was packed. When I arrived (about 2 minutes before 19:00), there were no more seats left, so I had to sit on a small chair that they put right in front of the stage. There were around five of us who had to sit this way. The stage was very small, and there were two mikes at the front of the stage. I was about 2 inches away from the mike! For each scene, the actors came onto the stage with their scripts and read their lines. There wasn't that much physical acting. 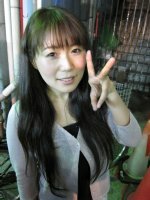 Itou Asuka played the lead role in the story. The story was about a 30 year old (or so) OL (office lady) who had a boy friend, who didn't want to get married. But there was one other guy in the girl's office who wanted to marry the girl. The girl wanted to get married, but since her boy friend didn't want to, she eventually settled for the guy in her office. But it seems she was pregnant!